If you are looking for good articles and forums on all things divorce, try out DivorceForce. 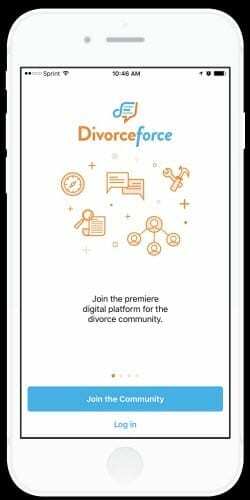 DivorceForce is an app designed to bring together a community of people going through divorce sharing their concerns. The app has forums on common issues and offers a supportive community, including professionals who often jump to comment and answer questions. It offers a well-organized library of articles on many topics that may be of interest to you if you are going through a divorce. DivorceForce also holds special events like a panel of experts working to answer questions from you live on special days like this last Valentine’s Day. The more people that use this app the better it will become, as people can share information about professionals and services in their area. There is already some presence here in Canada and growing the Canadian user base will make it more even more useful for us Canadians. I also like DivorceForce as they have several articles in their library written by me! There is a free version as well as a subscription for a premium product. DivorceForce is a good resource for Canadians as it organizes and edits the contents it puts out. The directory is easy to use and you do not have to filter through badly written or misleading articles to find the gems, since they are carefully picked out and edited by the staff and republished on the platform. DivorceForce is still evolving so remember that this is being written in February 2017 – things will be different and may be better by the time you read this! Having trouble sorting out your priorities during a separation? It would be an honour to coach you through your issues.